FREDERICK, Md. -- A new study led by investigators from the Frederick National Laboratory for Cancer Research in collaboration with colleagues from the Oregon Health and Science University (OHSU) utilizing a nonhuman primate model infected with Simian Immunodeficiency Virus (SIV) could have significant implications for future research into the prevention and potential cure of Human Immunodeficiency Virus (HIV). The study, in rhesus macaques, found that even if the SIV virus has spread to a limited extent beyond the initial sites of infection, if further spread of the virus is rigorously blocked, over time the initial pool of virus-infected cells can decay to very low levels or even completely. The research team, led by Jeffrey Lifson, M.D., director of the AIDS and Cancer Virus Program at the Frederick National Laboratory and Louis Picker, M.D. associate director of the Vaccine and Gene Therapy Institute at the OHSU, published its findings online Monday in Nature Medicine in a study that also included contributions from scientists at the Oregon National Primate Research Center, the Fred Hutchinson Cancer Research Center, and Gilead Sciences, Inc. The research builds on prior work from the collaborating Frederick National Laboratory and OHSU groups that demonstrated that a unique vaccine, which uses a modified version of the rhesus macaque cytomegalovirus (Rh-CMV/SIV) to deliver SIV antigens to the immune system, when administered prior to challenge with SIV (prophylactic vaccination), did not prevent infection, but in over half of the vaccinated animals led over time to eventual control and apparent clearance of the initially established infection. These results suggested that the vaccine might provide potential benefits when used for therapeutic vaccination—vaccination of already infected individuals receiving combination antiretroviral drug treatment (cART) that suppresses viral replication, but does not eliminate infected cells. To approximate the limited extent of spread in the prophylactically vaccinated macaques that went on to control and eventually clear their infections, for the therapeutic vaccination study (published Monday) the investigators started cART at the earliest signs of establishment of a systemic SIV infection. This approach resulted in different macaques receiving cART starting on different days after virus inoculation, from days four through nine. After the animals had been receiving cART for several months, either a SIV vaccine or a control vaccine was administered, then cART continued. Eventually, cART was stopped, and the animals were closely monitored to see if the virus came back (“viral rebound”) and to assess if therapeutic vaccination with the SIV vaccine helped to stop, delay, or control the extent of the viral rebound. Somewhat disappointingly to the investigators, there was no apparent benefit for therapeutic vaccination with the Rh-CMV/SIV vaccine. However, the most striking finding from the study was that regardless of whether the animals received the Rh-CMV/SIV or control vaccine, there was a strong correlation between when they started on cART and how quickly the virus came back. The later cART was started, the more the virus had spread by the time cART was started, and the more quickly it rebounded when cART was stopped. Most dramatically, when cART was started before day six after virus inoculation, none of the animals showed rebound virus over six months of follow up. The study results do not have direct implications for clinical treatment of HIV infection as the vast majority of HIV-infected individuals are not diagnosed until much later in the course of infection than the earliest treated macaques in the study. However, the results do have important ramifications for vaccines and other approaches intended to prevent HIV infection. The results are consistent with findings from another earlier study from the AIDS and Cancer Virus group and collaborators Dan Barouch at the Beth Israel Deaconess Medical Center and Harvard Medical School and Dennis Burton at the Scripps Research Institute in San Diego. In that study, the investigators showed that a neutralizing monoclonal antibody shown previously to protect against establishment of systemic AIDS virus infection in rhesus macaques did not completely block initial infection at the site of virus challenge. Rather, there was some initial spread of the virus to other sites. But over the first week following virus challenge, virus was cleared from all sites. Together, the results suggest that if a limited initial AIDS virus infection can be stringently and durably blocked from further spread, whether by prophylactic vaccination with the Rh-CMV/SIV vaccine, by a protective antibody, or in the current study, by cART, that initial infection can decay. Lifson and Picker planned the newly published study, which was performed at the Oregon National Primate Research Center. The AIDS and Cancer Virus Program investigators at the Frederick National Laboratory conducted the extensive virologic analysis for the study while Picker and colleagues at OHSU performed most of the immunological analyses. 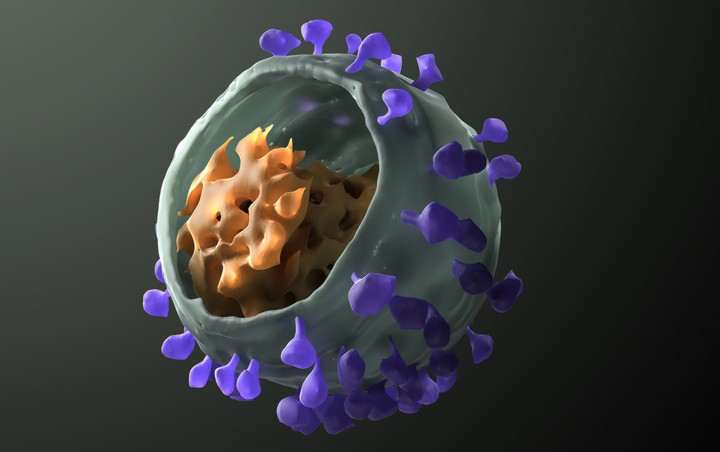 Image: Three-dimensional model of Simian Immunodeficiency Virus (SIV). National Cancer Institute image. Image by Sriram Subramaniam and Donald Bliss.